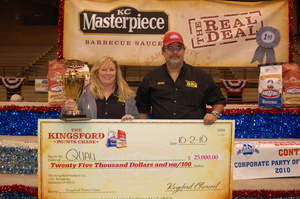 OAKLAND, CA--(Marketwire - October 12, 2010) - The makers of Kingsford® charcoal are pleased to announce competition barbecue team, QUAU, as the first-ever Kingsford® Points Chase Grand Champion. America's favorite barbecue brand awarded the team a hard-earned $25,000 and the honor of being one of the top teams on the competitive barbecue circuit at the 31st annual American Royal Barbecue Competition on Oct. 2. "In addition to participating in multiple contests, I attribute our success to the fact that we are not afraid to keep changing our cooking methods or recipes until we hit on something that works. Kingsford, our go-to charcoal, gives us the solid, steady burn needed for overnight cooks. Plus, when I'm not competing, it allows me to bring the smoky flavors from the competition to my own backyard." The Kingsford® Points Chase system allocated points to winning teams at 17 KCBS-sanctioned events during the core competition barbecue season and tallied teams' cumulative points to determine QUAU as the winner. Based on the KCBS barbecue competition rules and judging processes already in place, participants and winners in each of the overall food categories (pork, ribs, chicken, and brisket) were awarded anywhere from one to 80 points depending on their finishing placement during the events. In addition to points, teams that achieved first place in the overall category and used Kingsford® charcoal to cook at least two food categories were awarded $1,000 at each regional event. The American Royal Barbecue Competition seemed like a natural place to culminate the Kingsford® Points Chase and reward QUAU, who placed 24th overall in the Invitational, earning 12 points. Not only is it the world's largest barbecue competition, drawing more than 500 teams from around the world, but Kingsford® and its sister brand KC Masterpiece® have a storied event presence. "Our barbecue brands have a strong American Royal heritage, so it was even sweeter to crown QUAU as grand champions there," said Nick Meyer, marketing manager for Kingsford® and KC Masterpiece®. "In fact, KC Masterpiece won the first blue ribbon for sauce at the event more than 31 years ago and Kingsford proudly doubled the prize money of many of the winners for the second year in a row." For more information about the Kingsford® Points Chase, including a complete schedule of events and official rules, please visit www.KCBS.us/kingsfordrules, or check out www.Facebook.com/KingsfordCharcoal. While there, find out how to win the ultimate grill, a Komodo Kamado ceramic cooker worth more than $4,000. The Clorox Company is a leading manufacturer and marketer of consumer products with 8,300 employees and fiscal year 2010 revenues of $5.53 billion. Clorox markets some of consumers' most trusted and recognized brand names, including its namesake bleach and cleaning products, Green Works® naturally derived home care products, Pine-Sol® cleaners, Poett® home care products, Fresh Step® cat litter, Kingsford® charcoal, Hidden Valley® and KC Masterpiece® dressings and sauces, Brita® water-filtration products, Glad® bags and wraps and containers, and Burt's Bees® natural personal care products. Nearly 90 percent of Clorox Company brands hold the No. 1 or No. 2 market share positions in their categories. The company's products are manufactured in more than two dozen countries and sold in more than 100 countries. Clorox is committed to making a positive difference in the communities where its employees work and live. Founded in 1980, The Clorox Company Foundation has awarded cash grants totaling more than $80 million to nonprofit organizations, schools and colleges. In fiscal 2010 alone, the foundation awarded $3.5 million in cash grants, and Clorox made product donations valued at $8.8 million. For more information about Clorox, visit www.TheCloroxCompany.com. *PRIOR OWNERSHIP AND/OR PURCHASE AND USE OF A KINGSFORD® CHARCOAL BRIQUET PRODUCT IS REQUIRED TO PARTICIPATE IN THIS CONTEST (EXCEPT FOR RESIDENTS/PARTICIPANTS IN AZ, CO, CT, MD, NJ, ND, TN, VT). NO ADDITIONAL PURCHASE OR PAYMENT OF ANY KIND IS NECESSARY TO ENTER OR WIN. Open to Legal adult residents of the 50 United States and D.C. who are competitors in the KCBS 2010 Tour, 18 years or older. Contest pre-registration starts on March 1, 2010. Enter Contest by: September 30, 2010 at 11:59 p.m. EST. To enter visit www.kcbs.us/kingsfordpoints and for Official Rules and prize descriptions, visit www.kcbs.us/kingsfordrules. Void where prohibited.